MOGADISHU, Somalia (AP) - A man who calls himself an American promotes holy war in Somalia in a video posted this week on an Islamic militant Web site. A U.S. government contractor who tracks extremist propaganda says the footage is the first to show what may be an American with a senior role in al-Shabab, a Somali group the State Department considers a terrorist organization with links to al-Qaida. The half-hour video features an amateur English-language rap soundtrack and purports to show an operation against Ethiopian troops in Somalia. It appeared on Web sites where al-Qaida and other militant groups often post messages and videos. A caption says it was filmed on July 15, 2008. A tall man with long dark hair and a wide smile who appears to be in his 20s and gives his nom de guerre as "Abu Mansour al-Amriki," or "the American," urges Muslims around the world to send their children to replace his group's fallen fighters. "If you can encourage more of your children, and more of your neighbors, and anyone around you to send people ... to this jihad, it would be a great asset for us," he says. Al-Amriki speaks English with a North American accent and reads verses from the Quran in fluent classical Arabic. He appears to be of European or possibly Arab descent but it was impossible to independently confirm his nationality or where the video was filmed. The man appears in a scrubby rural clearing filled with short trees and dust. There are few identifying markers indicating he is in Somalia, though several of his companions appear to be Somalis. In the Somali capital, Mogadishu, a former fighter, Mohamed Muqtar, said he had met the man more than two years ago in the Islamist stronghold of Kismayo, Somalia's third-largest town. "This is the same man, the American man, I saw in Kismayo two years ago when I was being trained there," he said. "This man was training us how to make land mines and explosives." He could give no details on how he was able to identify the man. Farhan Haji, another former fighter who lives in Mogadishu pointed to the green shrubbery in the tape and said it did not look like Somalia. "This could be a Hollywood actor anywhere in the world," Haji said. Another English speaker does not appear on the tape but raps over a track of Islamic devotional songs. "Bomb by bomb, blast by blast, only going to bring back the glorious past," the man chants atonally. "Mortar by mortar, shell by shell, I'm only gonna stop when I send them to hell." Ben Venzke, director of IntelCenter, the U.S. contractor that tracks extremist propaganda, told the AP that the video appears to be authentic. "It was done in the same manner that all their releases are done," he said. 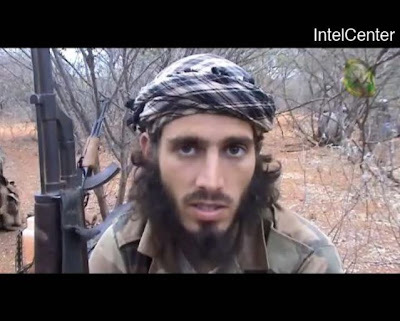 "We have absolutely no reason to believe it's anything but an authentic (al-Shabab) video." California-born Adam Gadahn has appeared prominently in al-Qaida videos in the role of a top propagandist. Gadahn, who goes by the nom de guerre of Abu Azzam al-Amriki, has appeared in videos talking about the defeat of America in Iraq and other battlefields with jihadists and urging Americans to convert to Islam. He has been indicted on treason charges, and the FBI has put a $1 million reward on him, calling him "an integral part of al-Qaida's media and recruitment branch." It is not known, however, if Gadahn has ever played a leadership role in al-Qaida. Some members of the thriving Somali community in Minneapolis and St. Paul have reported being questioned by the FBI as it investigates whether some young men are being "radicalized" in Minnesota and recruited to fight with terror groups in their homeland. "This is the first time an American has been shown in a leadership/senior role advising/teaching a group of jihadists," IntelCenter said in an e-mailed analysis. "This is a significant development and likely to be indicative of other developments within the group." Islamic groups in Somalia coalesced into a loose alliance with some clan militias to fight an insurgency against troops from predominantly Christian Ethiopia. The government had called in the Ethiopians to oust an umbrella Islamist group that held most of southern Somalia and Mogadishu for six months until December 2006. Under an intricate peace deal the United Nations mediated, the Ethiopians withdrew in January and moderate Islamic leader Sheik Sharif Sheik Ahmed was elected president that month. The weak government Ahmed took over in January controls virtually no territory and is struggling to prove its legitimacy, though Ahmed has been welcomed by influential Islamic clerics in this predominantly Muslim country. Ahmed's allies, however, control much of central and pockets of southern Somalia. The more hardline Islamist elements Ahmed split from last year such as al-Shabab, control most of southern Somalia.